We have a lot to tell you about today! Here's an overview of what occurred over then past few days when our individual groups went out to their respective villages to gather data for our upcoming water projects. We apologize for the lack of blog posts for the past few days. Last Friday, we broke up into our individual village groups and went out to our respective villages of Igunda, Wasa, and Lukani. Today, everybody returned from their respective villages to begin work on the water projects. Here is a brief description of what occurred in each village, starting with Lukani. The Lukani crew consisted of Andrew, Trent, Sam, Patrick, and our leader, Ken Smith. We arrived at Lukani after a 90 minute bus ride in a four wheel drive vehicle. The terrain to get into Lukani was very rugged and rough because of the rain that had been falling constantly the previous two days. When we arrived, we were greeted at the city hall by a majority of the water committee, some village leadership, and pastors of Lukani. The greeting was very warm and welcoming and they received us as their own. We then proceeded to have a meeting with the committee and village leadership in which they provided the village’s population, a map of the village, and their desires for where they would like water. As a group, we then walked to the highest point in the village which was a hill called Kilimahewa. The scenic view that was laid out before us was quickly washed away by the rain storm that swept in. This allowed us to discuss the water system in detail and do many of the calculations that would be needed in the future. The most interesting part of the day, however, came right before bed when Sam saw a panya (mouse) scaling the wall of the pastor’s house and ruptured many eardrums with his school-girl shriek. This was then followed by a hunting party being formed to chase after the panya. I will skip all of the excellent adventure and just tell you that they were successful. The next day consisted of pure data collection, as we walked the potential route for the gravity main that would supply water to the most populated part of the Lukani. With that data acquired, a second meeting with the water committee was held in which they were asked about their plans with the new system, and how they planned to make it their own and maintain it. The water committee also asked us questions to ensure that the system was what they had wanted. After the meeting, we were then able to play in a soccer game with the local kids of Lukani. The teams came out to be Trent vs. Sam and Patrick, with a final score of 2-1 with Trent’s team pulling out the narrow victory. Which brings us to this morning, when we were treated to a fantastic church service that was then followed up by an auction at the church. Many things were purchased but the smartest purchase of the day goes to Trent who bought a chicken, with a close second going to Ken who bought a goat. A large lunch was then served at the pastor’s house and gifts were given to the village for their wonderful hospitality. It was a fantastic experience for all with a special thanks to our accompanying University of Iringa student, Kulu, and our translator, Clement. The Wasa team consisted of Anna, Austin, Lauren, Brandon, and leader Cathy French. The four wheel drive Land Cruiser was put to good use as we crawled and slid our way to Wasa on muddy roads. As we pulled into the primary school in Wasa, the school children came running out to give us a singing greeting. They led us into one of the classrooms where we were introduced to some village leaders and water committee members. After the meeting, the Wasa team hiked about six miles through intense rain, mud, and rivers to collect data about the existing water system. A delicious dinner was served and we all headed to bed early, exhausted but excited for the next day. We woke up for fresh tea and breakfast, and packed our things for the day. We met with the water committee and other village leaders to discuss the water status, village priorities, and project plan. After lunch, the group set out to collect feasibility data for the proposed design and to take more measurements about Wasa’s current water system. The children were very curious as we walked around the village. One little boy even helped Lauren calculate flowrates by holding her hand. We attended the church service on the last day in Wasa. The service was filled with lots of singing and dancing. The pastor that had been hosting us in the village even brought us up on stage to introduce us to the audience and thank us for our work. Afterward, we played soccer with all the children from the church service. The winners (everyone) were awarded pipi (candy). We ate lunch with the pastor and some of the other village members and said our goodbyes. We were sad to be leaving, and wish everyone in Wasa a happy and healthy future. A special thanks to everyone that made our stay wonderful and to Amina, Hanael, and Brandi for helping us translate. The Igunda team was made up of Audrey, Becky, Hayley, Clay, James, Matt, and our leaders Dorothy and Ethan. After a bus ride down the escarpment—a windy, steep road—we received a very warm welcome to the village from the pastor, his family, and local leaders. We immediately met with the water committee, village leaders, and community members to get information about their water needs. We found out there was an existing water system in Nyanzwa, the neighboring village, and that it had three distribution points in Igunda. We also learned that Igunda had two hand pumps, but only one was working at the time. After the meeting we walked to these distribution points and important buildings in the village. The next morning we hiked to the water source for the Nyanzwa system to obtain a water sample for testing. Our test determined that the water contained harmful bacteria and was probably causing anyone drinking the water to get sick. In the afternoon, we split up into two groups in order to be able to get GPS and elevation information from every sub-village in Igunda. At the working hand pump, our group unsuccessfully attempted to carry a full 20 liter bucket of water on our head without using our hands. We gained an even greater appreciation for the villagers that were able to do this! After we were finished collecting data for the day, the community put on a performance for us. 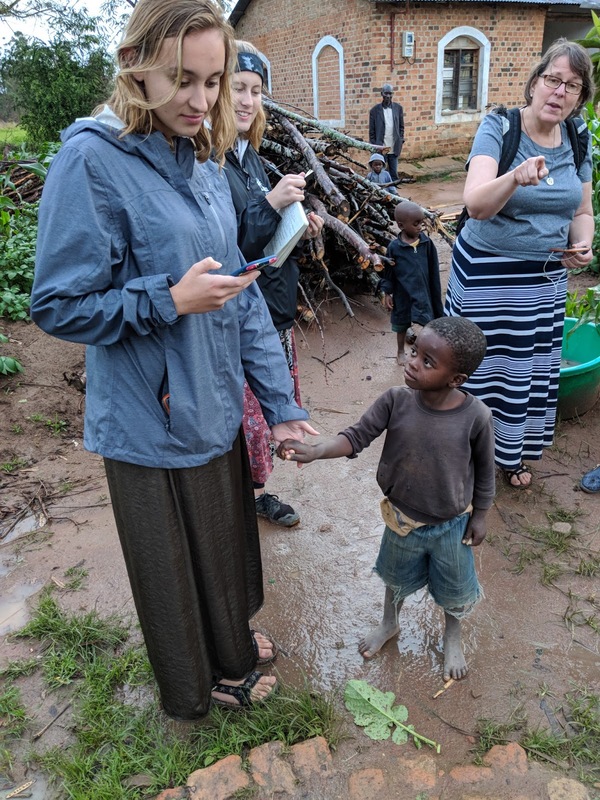 They sang about how excited they were for the possibility of clean water coming to Igunda and had us join them for a dance. Afterward, we sang a few songs for them and then got to play different games with the children. It was such an amazing evening, and it was heartwarming to hear from villagers how much of an impact a water system could have on them. It really put the importance of our work into perspective. On our final day in Igunda, we attended a church service where we got to sing for the parish once again. We had one last meal with the pastor and other leaders, where we presented them with gifts for providing us with such a welcoming experience. We really enjoyed our time in Igunda and are so excited to being designing a water system for this community.